Dr. Jacob O. Ogola is a commercial banker with over 15 years’ experience in credit risk management, currently Senior Manager-Credit Administration Unit at Commercial Bank of Africa Limited. Ogola joined USIU-Africa in the 1990s as a transfer student from Moi University (Faculty of Technology-Textile Engineering) having been awarded Jomo Kenyatta Memorial Scholarship to undertake his undergraduate studies. He was amongst the pioneer students of Msc. in Organizational Development (2007). He holds a Doctor of Business Administration (DBA) from USIU-Africa. Ogola is also an adjunct faculty in Chandaria School of Business-USIU-Africa. 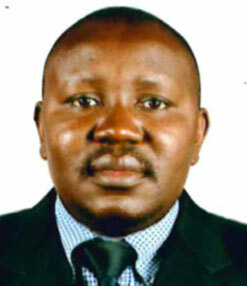 Ogola has been an active member of the association having been elected the Vice Chair in 2008. He served as a chair of the association from 2010 to 2015. He is passionate in building sustainable USIU Alumni Scholarship which he is positive will be achieved under the current alumni leadership.